Hey, thanks for the birthday wishes everyone. I appreciate it. And I do love that video that you got Tusk! I had no idea I was being filmed at the time. LOL. 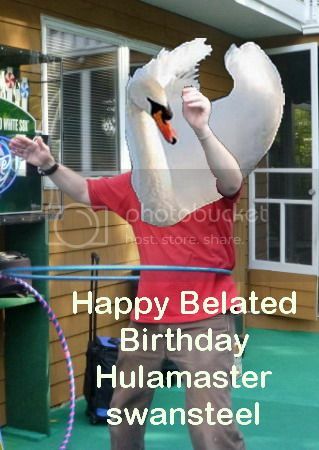 (02-20-2014, 02:42 AM)Swansteel Wrote: Hey, thanks for the birthday wishes everyone. I appreciate it. And I do love that video that you got Tusk! I had no idea I was being filmed at the time. LOL. Belated Happy Birthday wishes, Swan. Congratulations on getting through a great year, BG Days Haley Midnight Concert / Halien Shindig and all. I love the Haley Happy Birthday tweet to you. Glad for you and jealous.